While at the thrift store, I came across a pair of white shoes that looked brand new except for a few scuffs on the heel and toe of the right foot. Obviously the reason they were given away. Cost? $4.99. I snatched them up after remembering the Mod Podge Shoe post from Make It and Love It. Now I will sport a pair of fantastic heels that no one else will have. Because the wrapping paper isn't as pliable as fabric, use smaller pieces to cover the shoe. One to cover the toe, sides, strap and heel. Don't worry about seeing each piece, the paper's pattern hides the edges. It all blends together. After the shoe is covered with paper, coat with several layers of Mod Podge. Let the Mod Podge dry completely first before using an exacto knife to cut the excess off around the sole of your shoe. The paper will peel off leaving a thin layer of glue that is easily rubbed off with a damp wash cloth. (Optional) After I had trimmed my edges I sprayed the shoes with two coats of Krylon Crystal Clear Glaze which made them super shiny. Voilà! Now go out there and mod podge a pair of shoes for any occasion! Linking up to Xazmin's Mod Podge Mania! Oh my goodness those are cute! Holy Cow...those are fabulous! Oh, is there anything we can't find to Mod Podge! GREAT IDEA!! I would have never thought of that. The shoes turned out great. 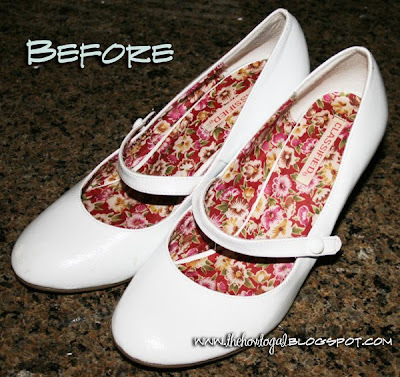 Wow, I had no idea you could Mod Podge shoes! Those are awesome! Your shoes are AMAZING. Seriously, I love them! I am putting that on my list of to-do things! I saw these yesterday and I think they rock! Esp. love the paper. Oh get out you did not mod podge shoes! Brilliant and I love the wrapping paper you picked! Aren't you clever! I love them. I cannot believe you mod podged your shoes...that is AMAZING!!! Love it!! oh my GOD these are beautiful! Have they held up? ?